How does EdbMails Backup for live Exchange works? Where do I set Private Encryption Key for the AES 256-bit Encrypted Backup? Can I use different Private Encryption Key for my account on different computers? Can I change my Private Encryption Key for my account? Do AES 256-bit encrypted backups are Incremental and compressed? How many versions the Exchange and Office 365 backup folder maintains? How do I restore backup data back to my mailbox? Can I test all the features of EdbMails Live Exchange Backup before I Purchase? What is prerequisite and system requirements for performing the Backup? Dose EdbMails provide storage space for Mailbox Backup? Is there a Cloud Backup option? How can I know the licensed mailboxes used for Backup? How is EdbMails Live Exchange Server Backup is priced and licensed? Dose EdbMails Backup Public folder and Shared folders? Is there an option to filter the scope of Backup data? Do EdbMails impose item size or speed limits for Backup performance? Do EdbMails support Backup of Outlook rules? During Backup operation will it affect on the performance for the Exchange users? Is there any limits to create Backup/restore jobs? Using EdbMails Can I Backup on my storage / shared network drive? EdbMails application for Exchange server can be installed on any windows 7 and higher version or Window server 2008 and higher machine with your domain. Application connects to your server via Exchange Web Services and Backup Mailbox data and Public folders to your local storage. To Backup the user Mailboxes from exchange server you need to provide impersonation rights to one of the user with admin rights. Login with that user in EdbMails application and perform the Backup. You can perform onetime Backup or continuous Backup with EdbMails. Continuous Backups are performed in cycles. The first Backup created is a Backup of entire data. Subsequent Backup create only the incremental Backup. It updates only the new mail items or deleted items in the Live Exchange server. Restoring the Backup file is possible on virtually every level: You can restore entire Mailbox or any specific folders. The target for restore action can be chosen. It can Office 365 or Live Exchange server. 1. 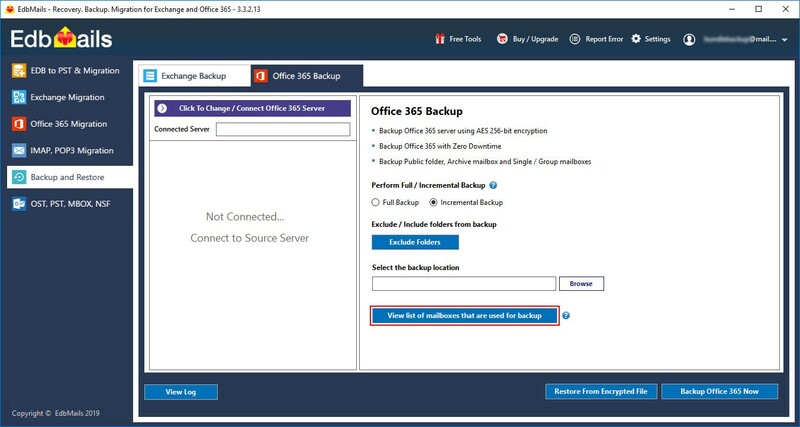 For encrypted and compressed Backup, select the option ‘Backup using AES 256-bit Private Key based Encryption’ in the Office 365 and Live Exchange Backup as shown below. 2. 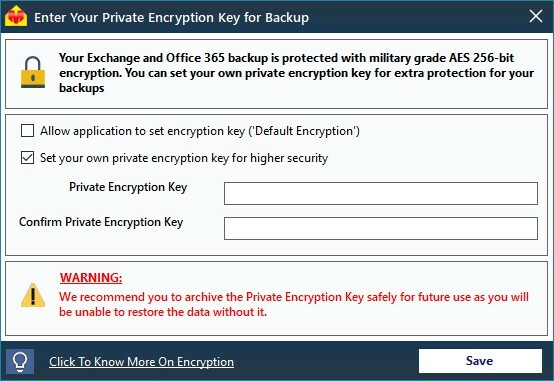 Upon selecting the AES 256-bit encrypted Backup, the Private and Default encryption key settings screen will appear as shown below. Follow the instructions provided in the screens to set the required encryption key. Note: It is important for you to archive the Private Encryption Key safely for future use as you will be unable to restore the data without it. No. To ensure the integrity of the backed up data, you can set Private Encryption Key only once for your account. The same Private Encryption Key must be used on all other computers for Backup. Initial backup is always full. That is, application will backup complete data from the selected mailbox on successful backup. Consecutive backup to the same location will be Incremental. That is, only the newly added (not yet considered for backup) items from the mailbox are considered for the backup by comparing the previous backup data. There by it will save the disk space and bandwidth. In addition, performance of the backup will be improved. Yes. AES 256-bit encrypted backups are Incremental and compressed. It will provide extra protection for your backup. It will keep files from FULL and Incremental backups for 30 attempts. After the 30 backup attempts, application will change the Folder to the next sequence number to perform the FULL backup, and every consecutive backup is incremental. 1.Click the ‘Restore From Encrypted file’ button from the Exchange Backup screen as shown below. 2.Select the file that you wish to restore from the backup location and proceed. 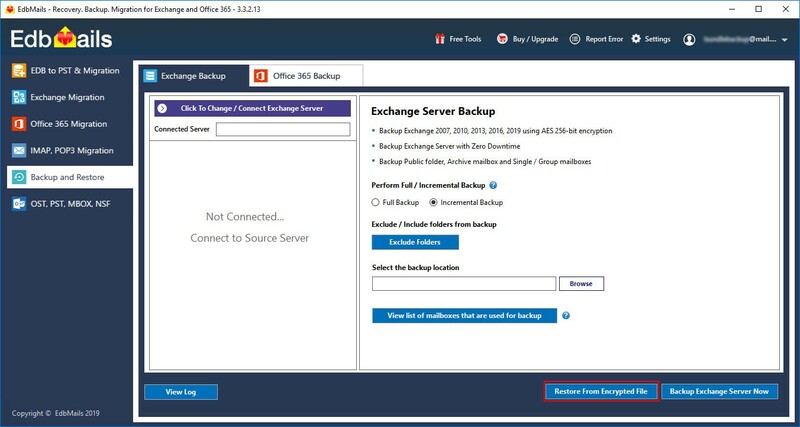 Yes, you can test live Exchange server Backup. Demo / Free trial will Backup 30 items from each and every folder maintaining the exact Live Exchange server folder hierarchy. You can Backup 30 items from each and every folders from your Live Exchange server to Encrypted file. Later you can purchase the license for full version of Live Exchange Backup; you can resume the Backup with incremental feature. 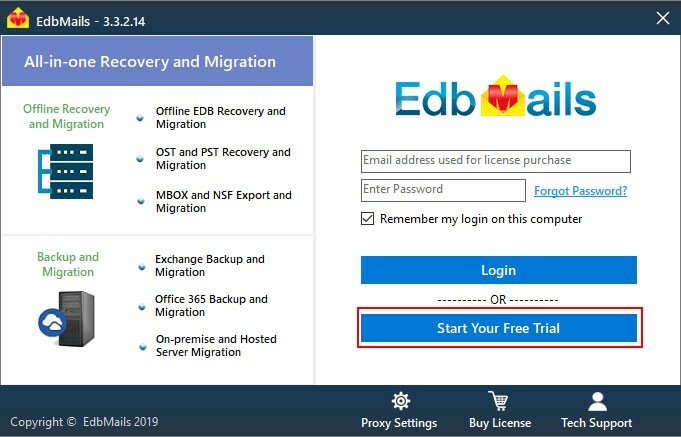 EdbMails Backup application can be installed on any machine that is connected to the Internet. Hard disk space depends on the amount of data you like to Backup. No, we don't. All Mailbox Backup files should be stored on your local computer. No, not yet. But we may give option to Backup your files on 3rd party Cloud hosting services in the future. It all depends on the size of data you want to Backup. 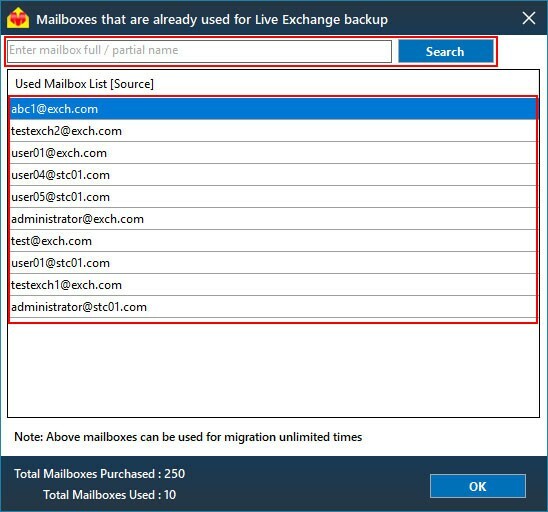 EdbMails Mailbox Backup for Live Exchange server will perform Backups until there is free space left. You get a list of Mailboxes that are already used for backup. Also you have search option to search the mailbox you are looking for. EdbMails Live Exchange server Backup license is priced annual subscription according to the number of Mailboxes. There is no monthly subscription available. On the expiry of your subscription you will be no longer be able to Backup data, but you will still be able to restore items. Yes. EdbMails backs up standard user’s and shared Mailboxes as well as public folders. No limits, the performance of Backup depends on environmental factors such as: speed of the hardware, speed of the Mailbox access, EWS performance, EdbMails Live Exchange server Backup for Mailboxes uses EWS to connect to the server. There is also no limitation with respect to Backup size. No, currently we are not supporting the outlook rules. The EdbMails Backup operation doesn’t impose any restrictions on the use of Mailboxes by the users. Users can continue to work as they normally would while EdbMails continues with the Backup tasks assigned to it in the background. This means no disruption to the workflow and zero downtime. No limitation on number of jobs to be created on EdbMails application for Exchange server Backup. Yes, you can Backup to a storage / shared network drive is possible through by selecting the storage destination in Back location.